If you purchase tickets for this event on your email order confirmation you receive, will be a special discount code that will allow you to purchase tickets for The Abba Revival gig on 9th February for only £8.00 each plus BF. Click the link below to see details for this great event! This discount is not valid on balcony table bookings. Come and blow off the Winter Blues with two great chick flicks! We'll be showing both Mamma Mia and Mamma Mia: Here We Go Again on the huge Winter Gardens LED screen with the Reaper PA filling in the gaps with music right through until 1am! Doors open at 7.30pm, VIP food platters will be served at 8.00pm with the first film scheduled to start at 8.15pm and a short break before the 2nd with a disco through until close at 1am. We will also be serving hot dogs, popcorn and have a fully stocked bar available. These tables are for a maximum of 7 people (booked under one ticket) and will give you a reserved table for the entire evening with a great view from the balcony. You will receive free popcorn and benefit from table service during the film showing (please order your drinks normally at the bar when you first arrive) should you wish to make use of it, with your waiters able to take both cash and card for your drinks orders. VIP HOT FOOD PLATTER OPTION - We are very pleased to be offering all of our VIP Guests the option to purchase a hot food platter with plenty of food for the whole table for just an extra £7.50 per head. These ticket options will be listed as a complete table including food so please make sure you pick this option when placing your order. Please let us know if you have any dietary concerns when you order. These tables are for a maximum of 8 people (booked under one ticket) and will give you a reserved table for the entire evening with a great view. You will receive free popcorn and benefit from table service during the film showing (please order your drinks normally at the bar when you first arrive) should you wish to make use of it, with your waiters able to take both cash and card for your drinks orders. PLEASE BE AWARE ALL MEMBERS OF THE TABLE PARTY MUST ARRIVE TOGETHER TO BE CHECKED IN UNLESS ARRANGEMENTS HAVE BEEN MADE WITH US PRIOR TO THE EVENT. 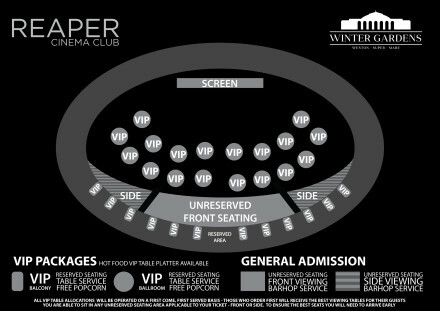 We offer two ticket options for the general seating areas - front and side. These are unreserved seats and will be a first come, first serve option so the earlier you get there the better the seat you will get although all the seats will have a great view of the screen! We will have pop-up bars serving cocktails and prosecco at the front of the room, so during the movie you won't have too far to go to get a drink, and we'll have hot dog and popcorn available for purchase during the movie.